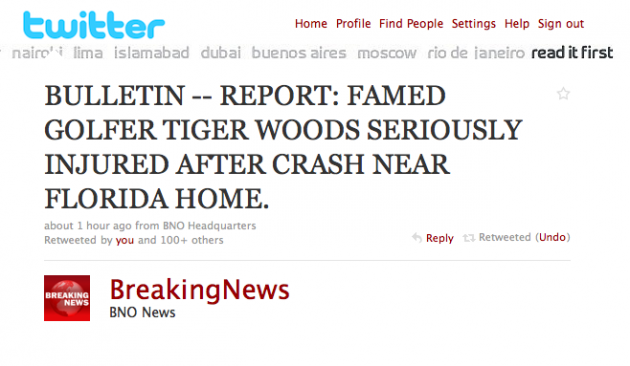 Undoubtedly by now you’ve heard about Tiger Woods’ car crash. Early reports had him in serious condition (which remember, is better than critical condition) after he apparently hit a fire hydrant and a tree while leaving his home in his SUV. The latest reports say he has been released from the hospital and is “fine.” But I’m not going to speak to any of that because that’s not what we do (you can find out more here). Instead, as I’m watching this unfold infront of my eyes on the Internet, I’m reminded that this type of story is exactly why the web is destroying newspapers, and should eventually even take down television and the main source of news for most people. I first heard the news via a BNOnews bulletin sent via push notification to my iPhone. I immediately pulled up Twitter and already some 10-15 people had retweeted it and the news was appearing in my stream. The message read, “BULLETIN — REPORT: FAMED GOLFER TIGER WOODS SERIOUSLY INJURED AFTER CRASH NEAR FLORIDA HOME.” Sure, not a lot of information there, but it’s clearly labeled as a report, and yes, it did turn out to be correct. And thanks to Twitter, thousands of people had access to this information about 45 minutes before it appeared on CNN or ESPN, the “worldwide leaders” in news in their respective fields. Of course, there is something to be said for these outlets independently verifying the news, but the the fact of the matter is that there was a report out there, filed by the police department and BNOnews was able to get it and send it out via Twitter much, much faster than any traditional news source. Information wants to be free, and the web, with services like Twitter, provides the easiest way for that to happen. Google was almost as fast on the case, as some 10 minutes after the tweets were flowing, it started showing reports from local Orlando news outlets (where the crash occurred) giving details of the crash. Within 15 minutes, we knew what time the crash occurred at, apparently what happened, and some other important details (like no alcohol being involved). That apparently took 45 minutes to get up. They could have called anyone on Twitter 30 minutes ago to get those details from what officials were saying based on what they had already read thanks to Twitter and Google. Anyone who doesn’t understand Twitter should look no further than situations like this. Which has been very clear for a long time. From earthquakes, to the massive fires in San Diego (in 2007), to the Mumbai shootings, to the situation in Iran, this is the future of information population, like it or not. It’s interesting to note that MSNBC.com recently reached a deal to take over the @breakingnews account (the one tied to BNO News). Here’s to hoping they don’t slow it down to CNN speeds. But if they do, someone else will come along with another service that will replace it. That’s the beauty of the Internet. It’s Darwinism unbound.